In the modern era, we hear the word “industry” and tend to think of large brick buildings, chimneys billowing smoke, workers trudging in through large iron gates to manipulate gears and cogs to produce… something. We might think more progressively of large steel buildings of assembly lines of safety-goggle-bedecked workers, busily whirring a drill gun or acetylene torch as some piece of car-part moves slowly towards its birth. We have to thank the industrial revolution for the transformation of industry from something denoted a type of work to something that denoted a much larger vision of work itself. Industry with the capital “I” is more in keeping with the idea of “diligence” and “purpose.” Much as there is a difference between a virtue and Virtue, there appears to be a difference between industry and Industry. It’s funny that sociologically, we classify societies as either “pre-industrial” or post-industrial. Whenever a place has an “industrial revolution,” which usually indicates the influx of machinery to replace human work of hands, we call that an “industrial society.” This may not be incorrect; yet, it smacks of some kind of idyllic life, lazily milking cows, getting up with the sun and sleeping at sunset. It seems to reflect a more pastoral, almost aristocratic sort of life prior to the onslaught of manufacturing as a way of life. A pre-industrial life was generally agrarian and had limited production, with artisans crafting limited items over longer periods of time. In general, communications took place within smaller communities, and villages were far more common than today’s large city and urban living. One might automatically assume a feudal society, with a Lord providing shelter and protection to his subjects, and his subjects providing him the substance to live. While this is true for a good deal of the European Middle Ages, that is only a small part of human history. Even after the advent of the creation of “cities” 10,000 years ago, humans have, for the most part centered around their small community, generally never being bothered by outside events. One of the most interesting, and perhaps hard to grasp, ideas that we should understand is that the concept of “work” is a fairly modern Western invention. Most cultural and social anthropologists today note that modern people tend to see work as something that obtains value, or has a “yardstick” attached to it, as Erik Schwimmer notes. However, ancient Greek and Roman authors, such as Cicero (Officiis), Xenophon (Cyropaedia), and Horace (Odes), looked at work in more moral and political terms; anyone who would be part of an “industry” for a salary or specie was little more than a slave and not ever worthy of citizenship status. However, if you worked on your own farm or in your own workshop, and brought those goods to the benefit of the community, were seen as an industrious person, a hard worker, and one whose work should be praised. Traders who brought far off goods to the community, and traded them for the communities goods were praised as industrious and good. While the origin of wealth via industriousness was important, it was where that wealth was applied that made all the difference. Community was everything, as was the freedom of depending on others to provide for family. From the time o f Ancient Greece to Medieval Europe, very little had changed, save for the advent of larger cities. Still, the agrarian “industriousness” held true. While working for the wealth of the community and not having to depend on others for your livelihood might seem at odds, they are not. 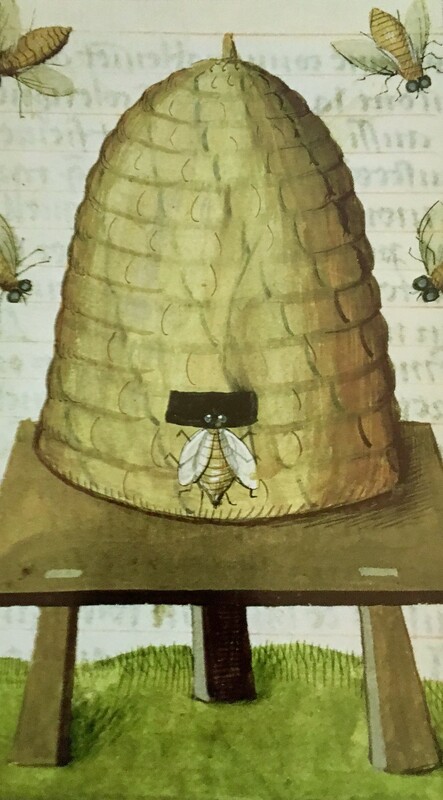 Interestingly, the Freemasons utilized the symbol of the beehive for just such a concept, and Lodges work mainly in the same format. An interesting article on the Beehive in Freemasonry, reprinted from a Masonic research society (AQC, 1923) is located here, on the Grand Lodge of British Columbia and Yukon’s website. While the concept industry and the beehive (and their associated bees) may seem to some a Christian or Mormon symbol, its use denoting “Industry” appears to date back to ancient Egypt, Greece, and Rome. Like a beehive, a Freemasonic Lodge is a community of people who have gathered and work for common purpose: to continue to provide an opportunity for others to enjoy Freemasonic teachings. Through diligence, purpose, and Industry, the group prospers. The wealth of the Lodge, the knowledge and learning of working together – is the honey of the beehive. This honey is shared in the community; thus, by diligence and purpose is individual, and his connections, nourished. Another aspect of this beehive concept is that while the individual may gain “wealth” from his Freemasonic work, it is not the reason that the group works together. In other words, the question is not what the Lodge and Freemasonry will do for you – it is what do you, the diligent and purposeful worker, bring to Freemasonry? The bees do their work, reflective of their offices and attention to the quality of the work, and the whole is rewarded. This is not an easy concept for our modern minds, which have been trained to that work is “trading time for money” or “talent for money.” Work is drudgery and work is mundane. Perhaps what we modern humans should focus on is the idea of Industry, not of industry. Perhaps our ancestors were not so off base when it came to the virtue of Industry. Further interesting information about workers in the ancient world can be found in the article, “Workers of the Ancient World: Analysing Labor in Classical Antiquity,” by Arjan Zuiderhoek, found in Volume 1 Number 3 2013 of the WorkersOfTheWorld international journal. This can be referenced on Academia.edu.